Have you read “Ear Health Part I: All About Ears” ? Proper ear cleaning is critical to avoid common ear ailments. My mother always said “an ounce of prevention is worth a pound of cure” and, as always with the maxims of mothers, this is worthy advice. With occasional maintenance and a few simple steps, your dog will remain ear-infection free for years and years. It seems to go without saying that you’ll want to keep your dog’s ears clean. But how do we go about doing that? Do we rub them down every day? Every week? Do we use soap or water or something the vet prescribes? Believe it or not less is more when it comes to your dog’s ear health. The more you mess with your dog’s healthy ears the more problems you will have. Monitor your dog’s behavior (is he rubbing or scratching a lot?) and take a peek in your dog’s ears when you’re doing your normal weekly health inspection. More on that in my post: Dog Health Inspection (link will be here when this post is posted!). Don’t wash your dogs ears on a constant basis, but do be sure that you wipe them out whenever your dog gets wet or has a buildup of wax on the inner flap of his ear. Cleaning ears carefully deserves its own post as it is definitely a task to be performed properly (and delicately). Clean is for more than the inside of the ears. If you have a dog with droopy spaniel ears you may want to look into getting a ‘snood’ to keep her ears and fur out of her food (especially if you feed a wet, raw, or species-appropriate diet). Keep the dog clean in general, as dirt, mud and muck can get rubbed into ears quite easily. And if your dog really likes having his ears rubbed and scratched (and what dog doesn’t?) make sure his nails and paw pads are clean. Your dog’s skin has a slightly lowered pH level that provides a layer of protection over his body called an ‘acid mantle’. This acid mantle helps to keep colonies of bacteria and fungi in check. Lots of things can negatively affect this acid mantle. Water, soaps, etc. can all wash this away. While washing your pooch is healthy for her, (especially when she has gotten some chemical or irritant on her or has rolled in some delightfully disgusting filth, which is unhealthy for the whole family) overly-frequent baths and baths with harsh soaps can destroy the skin’s natural protection against infection and parasites. Baths are necessary but it is important to use a gentle, mild soap that won’t dry out skin and strip away all natural oils. Try not to bathe your dog more than once a month unless he/she is genuinely dirty. Clean your dog’s ears when you bathe the whole dog and no more often than that unless an infection is present. If your dog produces a lot of ear wax you can gently wipe the inner ear flap free of wax using a warm, wet cloth or a natural oil preparation. Wiping down the outer ear (only the parts you can see) and the ear flap itself in this manner prevents the direct application of fluids into the ear canal. Using cloth or cotton that is already moist with whatever preparation you use prevents unnecessary disruption of the natural balance inside the ear canal. Wipe the ear only as often as the wax buildup begins to cause your dog irritation or discomfort, or begins to collect dirt and debris (making the ear actually appear “dirty”). Ear wax is a natural lubricant and protectant for the ear canal. The old ear wax migrates out of the ear canal the way it is supposed to, and is replaced with new ear wax. The old wax coats the outer ear and can cause a bit of irritation. This is a natural trigger to rub at the ears, removing the old wax coating. If you see wax build-up on the outer ear you should gently wipe it out with a clean cloth or a small amount of oil or other product intended for this purpose. You can mix up a bottle of Eden’s Ear Elixir as an all-natural ear treatment and moisturizer. I find this particularly helpful and much better than the chemical astringents that can be purchased from a veterinarian. Do not ever clean a dog’s ears with a Q-tip cotton swab. This is dangerous and it will just make things worse. Using cotton swabs will actually just shove unseen wax down deeper into the ear canal, disrupting the natural flow and causing an impaction. In the event the wax isn’t moving out naturally and you suspect it has blocked up the ear it is time to visit the veterinarian for safe and proper removal. If your pup gets wet and the ears are not dried out properly it can really cause a problem with your pooch’s ears. It’s important to gently dry the ears with a towel after a swim, romp in the rain or a bath. You can also use a gentle hair clip and pin/clip the ears up (together) on top of the head like an ear-ribbon bow. If your dog doesn’t mind the sound of a blow dryer you can certainly blast the outer ear flap (never directly into the ear canal) with a cool or very mildly warm stream of air for a couple of seconds after towel-drying. There is old advice still floating around to tweeze the hairs out of your dog’s ears. This is not necessary and in fact can be detrimental to the health of your dog. Hairs inside the ears are there for a reason (surprise, surprise, the dog’s biology is designed with functional parts and intentional placement). Hairs filter out and trap all kinds of dangerous foreign bodies. The sticky ear wax on the base of the hairs will also trap dust and debris, small insects and other particles that may otherwise travel deeper into the ear and cause serious damage. Ripping these beneficial hairs out just removes a layer of protection for your dog’s ears, and besides it hurts! Tweezing irritates the delicate skin and can result in scratching and rubbing by your dog, which will only make things get worse. Furthermore, it causes small wounds in the skin which open up the skin to invasion by infectious agents. Trimming the ear hair can also be quite irritating, as the blunted hair shafts can prickle and annoy your dog, causing him to rub and scratch and create problems. As long as these hairs are kept clean, following the same protocol as detailed above there is no reason to disturb them. Remember, for the most part natural is better. I’ve used expensive prescription formulas, & I’ve used ready-made over-the-counter solutions… but by FAR the best treatments can be made at home from very simple ingredients. I use my own formulation for inflamed ears which I often see in rescues. For the simplest cleaner use equal parts apple cider vinegar (or white vinegar) and filtered water on a cotton ball. For easy (& really awesome) recipes for ear treatments, check out Eden’s Ear Elixir for itchy, dry ears and the Eden Family Ear Remedy for itchy or inflamed or infected ears. While these recipes were designed for Cockapoos they are applicable to any dog and especially those with adorable, floppy or fluffy ears! Another tried-and-true recipe for cleaning problematic doggie ears can be found at http://www.zimfamilycockers.com/EarCleaner.html . Be sure to use this recipe in a bathroom as the amount of povidone-iodine can stain. The amount of iodine in the my ‘Remedy’ has never stained anything, in my experience. But caution is always recommended when using iodine. If you have a pup that is prone to any kind of infection (yeast or bacterial) it is a good idea to purchase an otoscope (cool little tool used to look in the ear canal and at the ear drum) and ask your vet to give you a little lesson on using it. This is a very handy tool and I use mine regularly. Excess water in ears: When bathing your dog you can gently place large cotton tufts or balls into the ear canal opening, to block water from running down into the ear canal. This is especially helpful for dogs with pricked ears or cropped ears. When swimming ensure the body of water you are using is a properly clean and treated pool or a natural source that is not stagnant. This is not only for your dog’s health, but also for yours. Stagnant pools and puddles harbor many dangers for both you and your dog. Blue-green algae, infectious protozoa and amoeba, hordes of bacterium, parasites and other dangers live in this kind of muck. Make sure there is some turbulence in the water and oxygenation for the best safety. Not all stagnant water looks like a swampy or nasty mud hole. Many lovely locations are dangerous, so be aware and never swim in water you are unfamiliar with (and the same holds true for your best friend). If you smoke indoors you have another reason to quit (or at least to take your habit into open air). The smoke lingering in your home or car is highly irritating and damaging to the very sensitive senses of your furry best friend. That smoke is damaging his eyes, sense of smell and his delicate ears. At a minimum open a window wide and don’t allow your dog to sit in the same room when you smoke. Keep your bathroom door wide open and well-ventilated when you spray hair-sprays, perfumes, scented freshening products and other air-borne chemicals. Be careful with cleaning supplies and try not to use these chemicals in the same room as your dog. Better still, switch to safer (and cheaper) cleaning supplies like baking soda, lemon juice, vinegar, borax and bleach-water. Remember that your dog can’t tell you when something is hurting or irritating him. You can’t assume that he is alright, just because he isn’t obviously complaining. Your dog needs at least 50-70% of all his/her calories from animal source proteins. A common cause for chronic yeast and bacterial infections of the ears (and other areas like the paws, belly, etc.) is from diet. These kinds of chronic yeast infections can become problematic for all dog breeds, even those with the shortest, most erect ear shapes. Ear trouble can occur when the carnivorous dog is fed a diet very high in carbohydrates. It does not matter if the dog is eating simple sugars or whole grains; plain and simple a dog’s diet should not consist of a majority of carbohydrates. Yeast feeds on sugar, as do many types of bacteria. Diabetic humans can attest to the frequency of skin infections due, in part, to unregulated blood sugars. It is amazing how something you put inside your body can have such a tremendous effect on organisms on your skin surface, but it certainly does. If you feed a commercial diet you aren’t going to be able to avoid large portions of carbohydraes. Ensure you choose a feed where the amount of carbohydrates per day is well below 50% of your dog’s daily intake of calories. A small amount is digestible and not harmful to your pet (and can even be healthy, dependent upon the source), but feeding a commercial diet (especially extruded or pelleted dog food) that contains more than 30-50% carbohydrate is asking for lots of trouble. Only one problem of this type of diet is chronic ear and skin conditions and infections. Note: There is little evidence to suggest the consumption of yeast in foods can contribute to yeast problems in dogs, but it is important to be aware the controversy exists and many commercial foods include brewers’ yeast (a product of the beer-making industry) as an inexpensive source of nutrients. All kinds of allergies tend to manifest themselves in the form of itchy ears and skin issues in dogs. This includes seasonal allergies as well as problems with certain foods (mainly those that are unnatural for the dog to consume in the first place). If you’re having ear problems but no actual infection is present it could be worth attempting an “elimination diet” to see if you can solve this problem. Allergy tests are largely inaccurate and unhelpful in these cases. Go on to Ear Health Part III; Recognize & Treat Ear Infections in Dogs to read the final installment of the series. 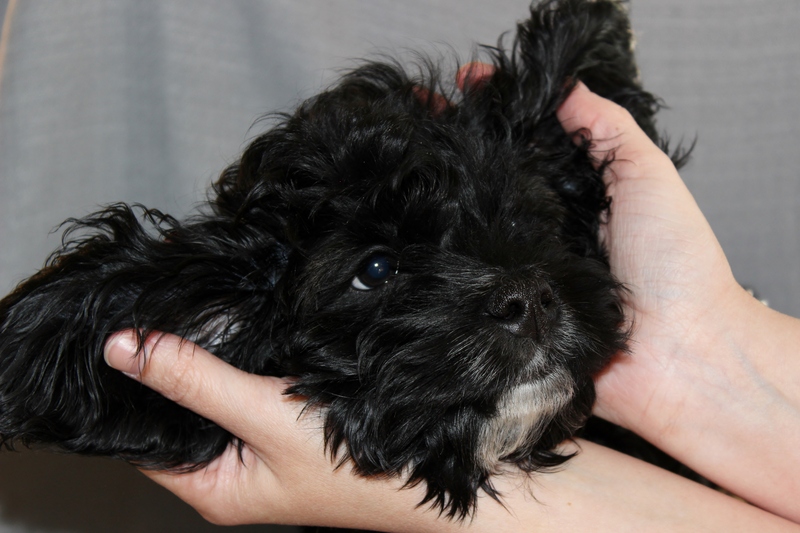 This entry was posted in Dog Health and tagged clean ears, cockapoo, dog, ear canal, ear infection, ear wax, prevent ear infections, yeast ear infection. Bookmark the permalink.